Home » You can’t see it, or figure out its shape: Is this the real new black? Forget the new black. This is the real black. A British nanotech company has created what it says is the world’s darkest material. It is so dark the human eye can’t discern its shape and form, creating what has been called a black hole. 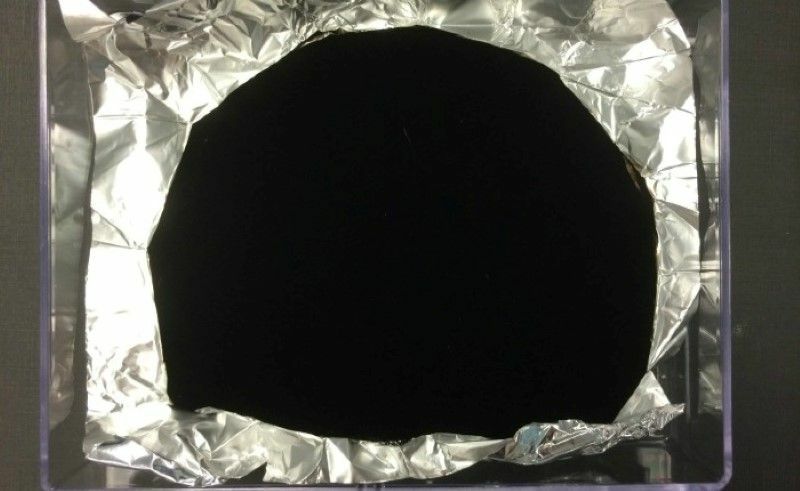 Vantablack, made out of carbon nanotubes, is designed by Surrey NanoSystems and absorbs 99.96% of all light that hits it. Conventional black, such as black paint or fabric, absorbs between 95% and 98% of light. The company says Vantablack was the darkest material ever tested by the National Physical Laboratory in the UK, as well as the Institute of Standards and Technology in the U.S. The material is made up of millions of carbon nanotubes, each measuring two or three nanometers — or roughly one millionth of a millimeter. It is grown on aluminium foil. Creases and bumps on the foil are easily picked up by the human eye. But once covered with Vantablack, all wrinkles and roughness seem to disappear. “Some people describe it as a hole, because there is literally not enough light coming from the surface to allow the eye to discern the contours that are in that foil,” Surrey NanoSystem’s Steve Northam told CNN. Sound like the ultimate slimming little black dress? Actually, no. A Vantablack dress would render the curves and contours of the human body invisible and cause “the wearer to look like a two-dimensional cardboard cut out,” Northam said. Instead, the material is designed to help airborne cameras, telescopes and infrared scanning systems work more efficiently by reducing stray light. Military clients are lining up to buy it, as is the space industry. So far, Surrey NanoSystems has only grown Vantablack on foil. It plans to grow it different materials and on three dimensional shapes.